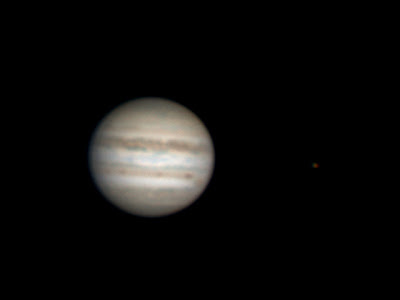 Here is an image I took of Jupiter on the 18th. It turned out blurry because the seeing was very turbulent. Jupiter has been low in the sky all year, right above the neighbors' rooftops. I think everyone in the neighborhood has their furnace turned on now and heat from the chimneys is stirring things up too much to get a clear view. So this is probably my last Jupiter until 2010. If you squint, you can see half of the Great Red Spot on the planet's right limb. It was visible in the eyepiece, too, even with the blurry conditions. The seeing on objects overhead was still pretty good though, so I'll be turning my focus to objects up there next time we have a clear night.